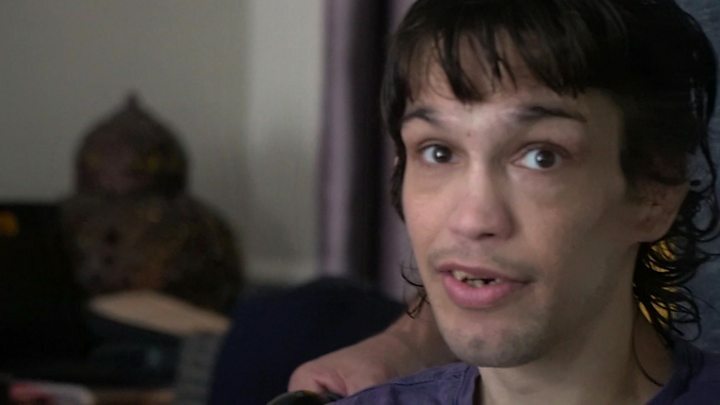 In July of this year, the BBC reported on Ian's case after it led to a call for the prime minister to appoint a commissioner to champion the rights of people with learning disabilities. Sir Stephen Bubb, who had written two reports for NHS England on secure units, described Ian's case as "all too typical" of the continuing failures vulnerable people faced. He says: "Knowing that testicular cancer is one of the most treatable cancers that there is, I was surprised that the decision had been made not to provide treatment and I wanted to understand what that was about." As a result, a second opinion was sought about Ian's treatment. "My concern was that perhaps judgements were made about the quality of life that he has because of his severe learning disabilities and because of the physical impact of how the cancer has spread," says Dr Wilson. "I'm also clearly aware that providing cancer treatment for someone with the problems that Ian has is a real challenge. "It is really difficult to give the best possible treatment to somebody in that situation, but my view is those challenges can be overcome." Ian is now undergoing chemotherapy at the Royal Marsden Hospital - and he is doing well. Ian's mother, Jan, says: "Especially when I thought there was no treatment and no cure, it was just a waiting game, but now there is hope." In a statement, the University Hospital Trust said a course of chemotherapy had been planned but Ian's condition had then worsened. It added: "The decision was therefore taken, in consultation with his family, to start palliative care. "The trust can confirm that Mr Shaw's learning difficulties were not a factor in the decision to move to a palliative care pathway." NHS England says it is working to reduce the health inequalities faced by people with learning disabilities. But neither it nor the Department of Health wanted to comment on Ian's case. In Ian's case, he is put under an anaesthetic for a short time while he is given the chemotherapy. The tumour has affected Ian's spine so he is unable to walk, but after 10 months in bed, in November he was moved into a wheelchair. In a joint statement, the charities Mencap and Challenging Behaviour Foundation said: "We know 1,200 people with a learning disability die every year when their lives could have been saved had they had access to good quality healthcare at the right time. "Failures to train healthcare professionals on how to support patients with a learning disability and the refusal to involve families in key decisions about their loved one's health continue to contribute to this scandal of unequal health treatment."